Darby Creek Trading, online at DarbyCreekTrading.com, is your destination for home décor products and inspirational gifts. Darby Creek Trading sells decorative vases, wall mirrors, wall art, lamps, tables, tapestries, wreaths, bronze figurines, and prayer plaques. Darby Creek Trading also offers religious framed artwork and prints, candles, pet memorials, crucifixes, inspirational mugs, floral wall baskets, flower swags, and flower centerpieces. RetailSteal.com has the best Darby Creek Trading coupon codes, Darby Creek Trading discounts, Darby Creek Trading coupons, and Darby Creek Trading promo codes. Shipping and handling rates at Darby Creek Trading depend on the pricing of your purchase and your shipping destination. All orders are shipped via UPS or FedEx. See website for full details, exclusions may apply. Take 15% off any order when using the coupon code while shopping online at DarbyCreekTrading.com. Click to save. Get 50% off all clearance items when shopping online using the coupon code at DarbyCreekTrading.com. Click to save. Get 10% off any order using the coupon code while shopping online. Click to save. Sign up for the email list at Darby Creek Trading to receive a free coupon. Click link to sign up. At Darby Creek Trading, buy select mugs for only $15. Click link to shop online. 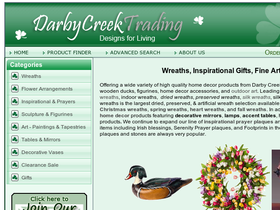 Pay as low as $14.95 for select gifts when shopping online at DarbyCreekTrading.com. Click to save. Shop for beautiful silk flower centerpieces from Darby Creek Trading starting for only $29. Click link to purchase now.